Waking in the middle of the night is normal, but sometimes it’s so perfectly arranged, and it happens every night at the same time. If you are one of these people that can’t explain what’s happening with them or why this occurs, I might have something that might interest you. Have you heard about the Chinese Organ? Some call it the Body Clock. It’s something that could tell you what’s going on. This Chinese Organ Body Clock works on a fascinating method. It uses chi moves through the body at different times in one day. At various times during the day, Chi moves from one system in your body to another. Its purpose is to restore end strengthen up. It’s a 24-hours cycle, and each system has 2 hours of chi charge time. Interesting huh? This cycle could explain why waking up in the middle of the night means. The time connects with the gallbladder. It’s a part of the body that works to break down everything you ate during the day. Waking up at this time means that you need to switch the diet and process healthier fats. It’s the time of the liver. You know how important the liver is, right? 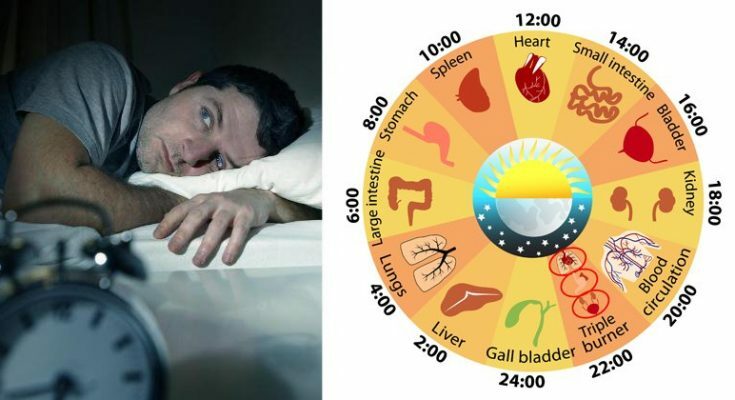 If you wake up during this time, it means that the liver is still working to offload the toxins from our body. Fixing your diet will result with solving this problem. It’s the time of the lungs to collect oxygen and move it to another part of your body or another system. It’s a preparation process for the day. It also works to remove the toxins that might be stuck in there through the night. If you wake up coughing this time that could be a sign that you need healthier foods and breathe clearer air. It’s the cleansing and renewal period for the large intestine. It’s a perfect sense why most of us feel a bowel movement at this time. If you want to help this process, you need lots of water during the day. What is the time you usually wake up during the night?